With this mount made from 1.5mm thick brushed stainless steel, mounting of the radiators of the airplex modularity system as well as airplex XT and airplex PRO series is possible in an enclosure. For installation a suitable hole must be machined into the enclosure, preferably into the top. 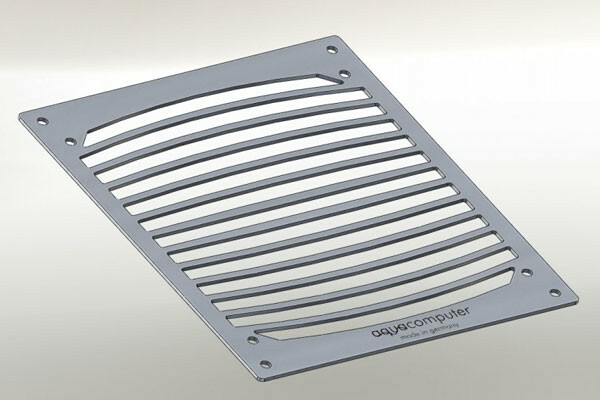 When installed this grill covers the edges of the cut-out, making possible imprecisions of the machining invisible and creating a clean and good-looking finish. On the installed grill the radiator an then be installed using any 140mm fans. Of course this radiator grill can also be used as an exclusive fan grill, without a radiator.